Indonesian iPhone 4 which was developed by Apple - USA officially released by the Telkomsel Indonesia in selling exhibition which took place from December 17 to 19 at Senayan City, Jakarta. iPhone 4 Indonesia were also present in Tunjungan Plaza Surabaya and at Mal Kelapa Gading 3 Jakarta (20 to 26 December 2010) and also the iPhone 4 is available in 15 GraPARI in Jakarta, Bandung, Semarang, Yogyakarta, Surabaya, Denpasar, Medan, Pekanbaru, Palembang, Balikpapan, Manado, and Makassar. iPhone 4 also available at all authorized outlets Apple Premium Reseller (iBox, eStore, Emax, PCMax, Infinite), Oke Shop, Sarindo, Telesindo Shop, Global Teleshop, and Cellular Shop. Apple iPhone 4 Indonesia is thinnest smartphone in the world designed from glass and stainless steel materials, displays FaceTime features that make video calls more real activity. Also equipped with the latest Apple displays feature retina with the highest resolution display ever presented on the phone to produce text, images, and video. iPhone 4 also features a 5 megapixel camera with LED flash, video recorder features high-definition, A4 Apple processor, and 3-axis gyroscope. 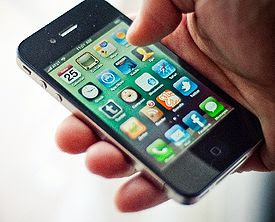 Battery life is more robust allowing for longer talk time by 40 percent. The software embedded in Cisco IOS 4 iPhone 4 is the output of Apple, the latest version of mobile operating system that includes more than 100 new features. The revolutionary App Store that provides access to more than 300,000 applications, including the new iMovie application is presented specifically for the iPhone 4.